Ihr habt bis zum 25. Juni Zeit, um euch mit euren Kurzfilmen beim Interfilm Festival zu bewerben. Man kann sich auch bei KUKI, dem Festival für Kurzfilme für Kinder, bewerben. Alle Informationen findet ihr auf der Interfilm Website . Es ist auch möglich, sich durch die Film Depot Website zu bewerben und sich damit bei anderen Kurzfilm-Festivals anzumelden. Viel Glück! If you have a short film you want to show to an international audience this is your chance: the call for entries of the 27. International Short Film Festival Interfilm, that take place in Berlin, is open! Go on the Interfilm Festival Website or register through the Film Depot Website that also gives you the possibility to apply for other Short Films festivals. 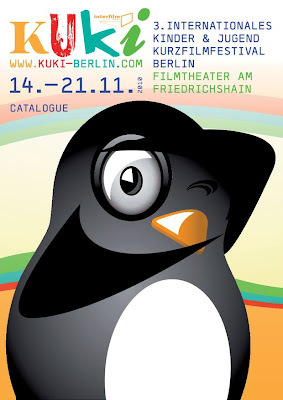 You can also enter the competition for KUKI, the section of the Festival dedicated to short films for kids. The Festival will take place from the 13th to the 20th November 2011, obviously in Berlin! Good Luck! Se avete un film corto che vorreste mostrare al grande pubblico internazionale, questa e' la vostra occasione: sono aperte le iscrizioni per il 27mo Interfilm Festival di Berlino. Registrate il vostro corto sul sito ufficiale del festival oppure servitevi del sito di Short Film Depot, che vi registrera' anche per altri Festivals di corti. Inoltre potete registrarvi per la sezione dei cortometraggi per bambini, il KUKI festival. Il Festival si terra' dal 13 al 20 Novembre 2011, naturalmente a Berlino. Buona fortuna!